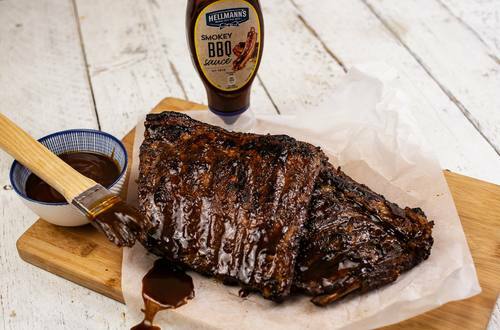 Starting in the slow cooker for soft, tender meat & finishing on the bbq for seared & smokey flavours makes this a foolproof ribs recipe every time. 1 Combine BBQ sauce, apple juice, Worcestershire sauce, chili powder, fennel seeds, paprika, thyme & brown sugar in a small bowl. 2 Season the ribs and place in the in a slow cooker, pouring the sauce over each rack. 3 Cook on high for four hours. Prepare the bbq to grill cook at medium temperature. After four hours, remove ribs from slow cooker and reserve sauce for glazing. 4 Place ribs on the bbq and liberally glaze each side by brushing on reserved sauce. Grill for 10 minutes, turning regularly. Glaze one final time before removing from the BBQ. Allow to rest for 10 minutes before serving.